Ranya Idliby was raised in Dubai and McLean, Virginia. She holds a bachelor of science from Georgetown University's School of Foreign Service, and earned her MS in international relations from the London School of Economics. She lives in New York City with her husband and two children. How did the book's format (a three-way memoir written in first person) contribute to the overall feel of the book? At what points did the women write different versions of the same event? (One specific example can be found when Ranya confronts Priscilla about the Israel/Palestinian conflict.) How does each woman's individual prejudices and religion color her interpretations of the discussions? How does each woman's role as a mother influence the direction and tone of the Faith Club? Would the club have been different if it had included mothers as well as women with no children? How did the children play a role in the challenges to each woman's faith? To which woman did you most relate, and why? Was it the one you expected when you began the book? If you identified with one of the women because you share her religious beliefs, did you agree with her presentation of your faith? What did you disagree with, and why? Much of the first half of the book deals with Suzanne's and Priscilla's struggles to define anti-Semitism and to confront their prejudices about the other's faith. Did you feel that Ranya was unfairly relegated to the role of "mediator", or did she welcome it? "For months, I had to bide my time patiently." Why do you think Ranya waited to bring up her own struggles with Suzanne's and Priscilla's faiths? Ranya says, "The more that science unravels about the wonders of life and the universe, the more I am in awe of it." Do you think this combination of science and faith is realistic, or must one ultimately take precedence over the other? Suzanne's first sentence speaks of the "cozy, homogeneous community" at her Episcopal church. What is Priscilla's "comfort zone"? What is Ranya's? How does each woman step out of her individual, cozy and homogeneous comfort zone, and in what ways does each remain there? Priscilla wonders if worrying is "a form of gratefulness." What do you think she means by this? Does Priscilla's worry ultimately strengthen her faith? How does each woman show gratitude in her life and in her faith? Craig Townsend tells Suzanne, "The opposite of faith is not doubt, it's certainty." What does he mean by this? Is doubt necessary for true faith? In Chapter 12, "Intimations of Mortality," the women discuss their differing views about death and the afterlife. Which understanding of death was most comforting to you? Which image of the afterlife was most comforting? Are they from the same religion? 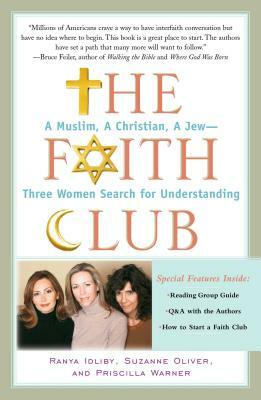 When Priscilla confronts Suzanne about her confession that she was uncomfortable being mistaken for a Jew, Ranya says, "She wouldn't want to be a Muslim, either." Do you agree? Why or why not? Is Suzanne's discomfort an inevitable result of being a member of the majority, of "not [being] forced to accommodate [herself] to the culture, religion, or even friendship of minorities"? Ranya provides a vivid description of her own method of prayer: "My prayer is essentially a form of meditation in which I singularly apply my limited human physical capacity to try to connect with that omnipresent universal unknown force: God." (Suzanne's description of her prayer is on page 162; Priscilla's is on page 175.) How is each woman's method of prayer different? How is it similar? How do Suzanne's, Ranya's, and Priscilla's prayer styles reflect the differences and similarities in their childhoods?